Experience the grand mountain that defines Alaska, the "Great One" and the abundant wildlife that thrives in Denali National Park on this 3-day/2-night tour. Enjoy your time in the Denali area and take part in one of our several optional tours like flightseeing and landing on a glacier or a backwoods ATV adventure. Enjoy dinner and a show at the Music of Denali Dinner Theater at McKinley Chalet Resort featuring family-style dining and a spirited original musical about the first men to reach the summit of Denali. 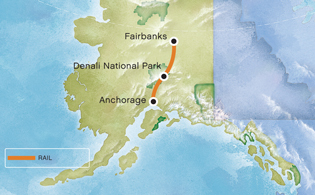 Travel aboard Alaska Railroad's Adventure Class (picture windows) from Fairbanks to Denali. Upgrade available. Anchorage accommodations are not included. Enjoy a morning at leisure. This afternoon, re-board a luxury railcar and travel to Alaska's largest city, Anchorage. Your tour ends at the Anchorage rail depot.